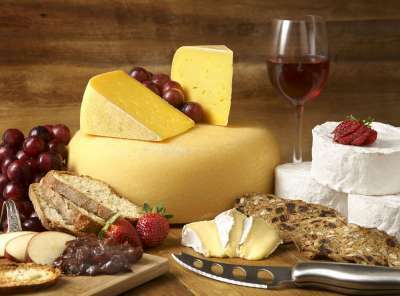 Awards and distinctions at the 2014 Canadian Cheese Awards, 1st prize in the bloom rind cheese category at the 2013 Sélection CASEUS contest and 2nd place among soft, farmstead cheeses at the 2011 American Cheese Society competition. This double cream cheese has a fresh mushroom aroma, combined with the taste of goat’s milk and cream. Sœur Angèle , under its white and fluffy rind has a melt-in-your mouth to runny texture, with a very soft core. The mushroom aroma of the rind complements the creamy and buttery taste. During the ripening process, its pinkish-orange rind is smeared with grayish-white penicillium. Le Fou Du Roi offers a creamy flavour with buttery, grassy and nutty aroma. The interior has a supple, melt-in-your-mouth texture with aromas of butter, peanuts, hay and a touch of farm goodness. This 2 year Cru du Clocher still has its creamy texture, but it also has more pronounced flavours. This cheese has developed a bite and it is well balanced with the milky, smooth cheddar flavour. Le Cru du Clocher has a marvellous taste that is reminiscent of Cheddars made fifty years ago, when there was a cheese maker in every village.